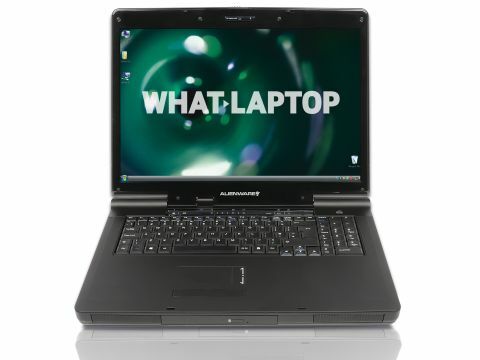 Better known for its high-end desktop gaming machines, Alienware also makes gaming laptops. The Area-51 m9750 (£2600 inc. VAT) boasts a high specification within a relatively compact chassis. The most striking aspect is the alien-inspired design. From a glowing alien's head and ribbed sections on the rear of the casing, to dedicated desktop themes, this machine will be noticed. Open the display and you'll find a glossy 17-inch panel. It's ideal for playing games, with the Super-TFT coating helping to create vibrant images. That said, it's not as bright as it could be. But it's particularly sharp, and offers more than enough space for opening multiple windows or playing games in the highest resolutions. As befitting a machine of this price, 3D performance is impressive. With two high-end Nvidia GeForce Go 7950GTX graphics cards in place, set up in an SLI (Scalable Link Interface) configuration, the m9750 easily coped with our 3D benchmarks. We also found it ran S.T.A.L.K.E.R. at higher frame rates than rival machines, making games more lifelike. While performance is second to none, the 7950GTX is soon to be replaced by a DX10 solution, which will lead to even more realistic gaming. Driver problems currently prevent Windows Vista from running both graphics cards, so until drivers that support SLI are released, you'll have to opt for Windows XP if you want to experience the full power of this machine. The 17-inch screen creates lots of space for a comfortable keyboard and large palm rests. The keys are well mounted, and there's also a dedicated numeric keypad which helps when playing First Person Shooter games. Although build quality is good, the bottom and rear of the machine heated up during use - a downside to packing two graphics cards and twin hard drives into a relatively thin chassis. A high-end Intel Core 2 Duo T7600 (2.33GHz) processor is fitted. It does, however, lack the features and overall efficiency found on the Centrino Duo platform. That said, with an efficient design, the Alienware was particularly rapid when performing day-to-day tasks. With two 250GB hard drives in place, there's also more storage space on offer than on any laptop we've seen to date, offering more than enough room for all your music and games. It's taken Alienware a while to release this laptop - the Rock Xtreme SL Pro has been available for the past year - but the result is worth the wait. Performance is second to none, and the Alienware remains a usable machine.